Get your best grades with this Cambridge International AS and A Level Geography Revision Guide. An international focus, including examples and case studies from around the world. 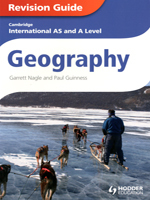 Also available: Cambridge International A and AS Level Geography textbook (ISBN: 9781444123166) by Garrett Nagle and Paul Guinness and endorsed by University of Cambridge International Examinations. This title has not been through the Cambridge endorsement process.